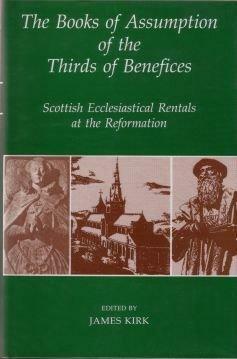 This primary source offers comprehensive insight into the income and expenditure of the Scottish Church, and a snapshot of the entire ecclesiastical structure, just as the Reformation was taking hold in and after 1560. The late medieval Church was the wealthiest institution in the Scottish kingdom, with an annual income ten times that of the Crown. The "Books of Assumption" were compiled for the Crown c1562 as a survey of all ecclesiastical livings (from archbishoprics to chaplainries and altarages), forming a record akin to England's "Valor Ecclesiasticus". Arranged topographically for the whole country (except Argyll and the Hebrides), this series of rentals is a major source for the study of early modern Scottish history.